Positives: Ceiling And Consistency: If Gaff plays well, the Eagles play well and more often than not, get the four points. If we’re talking pure outside runners, the West Coast winger would have to be right up there with the best in the league. His elite endurance allows him to spread well, cover the ground and spend 87%+ time on ground each outing. Gaff is the go-to man when exiting stoppages where his foot skills and ability to send the ball into the forward 50 are regularly utilized. This, of course, means he racks up plenty of the ball almost every week. Last year, Gaff showed us how big he can go, by posting scores of 144, 146, 130 and 124. And in 2018, he has pieced together six 120+ scores including back-to-back 140’s in rounds 15 and 16. Whenever I watch Gaff, which to be honest isn’t all that often living in Adelaide, he always seems to be ready for the release kick on the outside of stoppages and seems to go big. Even his tackle numbers aren’t that bad for a strictly outside-only wing-man. Uniqueness: For a guy who is currently going at 112 with a three round average of 124, averaged 100 last year and has pretty much been Fantasy relevant his entire career, Andrew Gaff still doesn’t get the attention he deserves. Just over 15% of coaches own the ball magnet, making him a potential ace with finals just a week away. Negatives: Tag Threat: The only real concern with Andrew Gaff is his inability to break a tag. Last season, Levi Greenwood did a very good job, restricting him to just 16 disposals, 2 marks, 2 tackles and a season-low, 51 Fantasy points. It’s no surprise the Eagles lost to Greenwood’s Magpies that day. Whether or not teams send someone to him or teammate Luke Shuey remains to be seen, but if history is anything to go by, his scoring is definitely affected. Positives: Consistency: Coniglio’s consistency this season places him right up there with the very best premium midfielders. He has managed a massive thirteen hundreds and dropped below the three figure mark a mere three times. Even when he has slipped below the coveted ton, Coniglio maintained the respect by still notching up two 90’s (Score of 71 against the Lions at the Gabba is the outlier). Cogs, a vital instrument in the Giants midfield orchestra, finds different ways to score instead of relying on one or two statistic areas. As all the better midfielders do, he finds the ball (averaging 28 disposals) but, crucially, is also averaging 4.6 marks, 5.1 tackles and has kicked 14 goals from his 16 games. Fixtures: The Giants, who are arguably the form team of the competition having notched up six wins over the past seven games with victories against Richmond and Port Adelaide in the past fortnight. There charge for the finals continues this week when they play the lowly St.Kilda before facing Carlton in round 20. This means points galore for Conigs. Adelaide, Sydney and Melbourne round off the year. Value For Money: Considering the types of numbers he’s put up this season (averaging 109), for Conigs to be priced below $700k makes him a seriously lucrative trade-in option. Is there a better value for money option out there, especially one in the sort of form Coniglio is in. Negatives: Ceiling: Perhaps a dodgy criticism here. However Coniglio has managed four scores of 120+ and just the one 140+ which came way back in round one. He hasn’t gone 120+ since round ten. By no means should this really prevent you from going ahead and trading Cogs in. However it is worth noting that Coniglio is primarily a 100-120 point scorer. Verdict: Cogs and Gaff have both posted some terrific numbers over the course of the entire season. Although the Eagle wingman has a higher ceiling, Coniglio is almost $100k cheaper and, at-least at this stage, a better value selection with Carlton and St.Kilda in the next fortnight. Cogs for me. Positives: Ceiling: In terms of ceiling, look no further than last weekend for a glimpse into what Alex Witherden is able to produce on his night. One of the most promising young prospects in the league, Witherden was super across the half-back line against the Crows. He mopped up terrifically well, collecting 31 disposals and 12 marks in a role which allows him to pick up plenty of uncontested ball. Although it’s an irrelevant statistic in Fantasy circles, his 735 metres gained, foot skills and ability to read the play were all seriously good for a second-year player. Witherden’s four tons have been 123, 127, 116 and 138 – indicating his high ceiling. Uniqueness: Witherden is currently owned by around 4% of the competition, but expect that number to rise a touch over the coming days after his big score against the Crows. I suspect it’s only a matter of time before Witho elevates himself up onto the lofty perch n alongside the likes of Laird, Lloyd and Yeo as permo defenders. Role: As a youngster coming through the ranks at the TAC Cup’s Geelong Falcons, Witherden broke his leg in his draft year but showed enough promise as an underager to warrant a selection in the first round of the 2016 National Draft. With a lovely kick and ability to find a heap of the ball, Witherden plays the half-back role extremely well and has fitted into the Brisbane backline with ease, having already played 27 games. Negatives: Consistency: Regardless of how bright his future appears, the statistics suggest Alex Witherden can’t really be trusted at such an important period of the Fantasy season when it comes to consistency. He has gone under 70 just once (55 in injury-affected game against the Swans) but has notched up nine scores between 70 and 90. Although he will start to turn those 80’s and 90’s into tons soon enough and his ceiling is high, Witherden’s form over the course of the season is a bit of a worry and makes him a risky yet bold inclusion. Positives: Consistency: The West Coast skipper has dropped under 80 points just three times this season, having never previously been as relevant as he currently is. Hurn has recorded five hundreds and four 90’s, playing his natural role as the designated kicker across the Eagles half-backline. The Eagles are flying high and Hurn is thriving in what has been the best season of his 13-year career. Never before has he averaged in excess of 80, however this looks set to be broken if Hurn is able to maintain his current 92-point average. By picking the 30 year-old, you can pretty much rely on him to produce 85-110 each week, at-least according to the numbers. Fixtures: The Eagles, who appear a certainty to lock in a home final, have a reasonably easy run home. This weekend they face North at Blundstone Arena, who are ranked 12th for points against and sit in the middle of the pack for 100’s and 120+ scores conceded. West Coast head back to WA for the derby in round 20. Hurn scored 124 on the Dockers earlier in the season and, given their lowly points against rankings, this should see Hurn score heavily again, in theory. 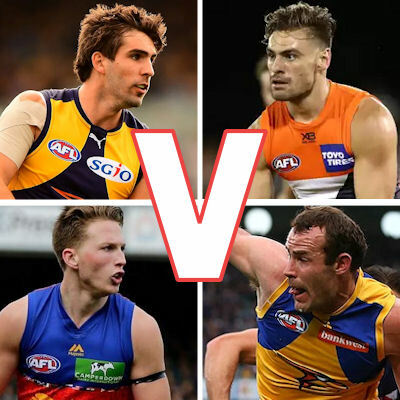 The Power at Adelaide Oval (ranked highly in all three categories) looms as a more difficult matchup, as is the game against Melbourne in round 22. The improving Lions round things off in what is a promising stretch for Hurn and his side. Uniqueness: Not a renowned Fantasy star, Hurn’s ownership is currently still under 12% despite this figure increasing each week, after his back-to-back tons to kick off the season. With such a large chunk of the higher ranked coaches owning the same premo defenders, Hurn could be the steady-scoring POD you’re after. Negatives: Ton Scoring: Sure, Hurn has been consistent this season, however he has recorded just the five tons for the year. Additionally, he has just one triple-figure score in the last six games. Questions must also be asked over his ceiling with Hurn breaking the 120+ point barrier just once (124 against Freo) so far this season. So although he’s good for a nice, solid score that will keep him off the chopping block, there has to be some doubt cast over Hurn and his ability to pump out the high scores when it really matters. Verdict: On one hand we have the youngster who has proven to coaches that he does have a high ceiling. He’s being compared to the seasoned veteran and captain of the Eagles with consistency and a set of favorable fixtures. It’s tough, but fortune favors the brave and I’d be backing in Witherden here. Trade one one of Gibbs or Tim Kelly for Gaff? Matt Crouch or Macrae? Will Crouch be a Top 8 mid for rest of the year? Macrae’s score last week was a hard tag from Hutchings. He has a fantastic record at Mars against Port. Thoughts on Shuey vs Adams vs Ross vs Heppell for the run home? De Goey – worth keeping or trade out? I’m in favour of these new rules being trialled shortly. I also think teams should jog out on the ground together like soccer but should also hold hands at the same time. with you Ned is dumb, and definitely agree should not be trialled in dead rubber games theres no such thing as dead rubber, % and ladder position come into it, for draft picks etc, as well as coleman and brownlow medals etc..
"look at me, Im Nedtard kelly"